John Honeyman & Keppie additions and alterations to the exterior of the church were modest. Later alterations to the interior of the halls have removed any trace of their work. There is strong stylistic evidence to suggest that Mackintosh designed the church furniture, and the exterior railings. How John Honeyman & Keppie came to be commissioned is not known. No drawings for the work survive. In 1898, the original church of 1832, with its Gothic battlemented E. front, was extended W. by a bay with a hipped roof to accommodate an additional 200 worshippers. 1 In the W. wall of this extension a small rectangular chancel with a hipped roof was built and porches were added N. and S. at the point of extension. The new bay and chancel follow the masonry style of the church: yellow-brown and grey sandstone laid in Aberdeen-bond with smooth pink ashlar dressings and eaves cornice. The porches are coursed yellow-brown rubble. The colour of the extension is very close to the stone of the original building and the job-book entry notes that some building materials, presumably from the demolished W. wall, were reused by contractors. The exterior corners of the extended church and the chancel have smooth pink ashlar quoins. The round-arched windows on the ground floor of the church, the bipartite windows above, the two round-arched windows in the chancel and the openings of the porches are all elegantly dressed in smooth pink ashlar sandstone. A group of single-storey subsidiary halls immediately W of the church is accessed internally via a door from the chancel. The masonry here follows the pattern of the church. The attached square hall at the N.W. of this group was added after 1938. The rubble boundary wall and wrought-iron railings are part of John Honeyman & Keppie's work. 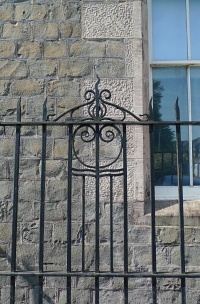 The railings by Bryden & Middleton remain in situ; a narrow plaque on the S. entrance gate gives the makers' names. Bryden & Middleton provided wrought-iron work for the practice's near-contemporary jobs: Redlands at Bridge of Weir, and the Daily Record building. The design incorporates variations on a motif which includes a lyre form, vertical spars and tulip-like forms. Inside, the original organ cases were repositioned along the two short sides of the raised chancel. The new octagonal pulpit carved in a mix of Gothic and Art Nouveau, was placed centrally in front of the chancel – as one might expect in a Presbyterian church . New but more modest choir stalls were placed on either side on the raised area. According to the job-book entry, the pulpit, choir stalls, communion table and rail were all made by Hutcheson & Grant, while other, unspecified items of furniture were made by Francis Smith. The rail does not survive and the present (2011) communion table and other items of furniture were introduced in the 1920s. The interiors of the single-storey buildings have been reorganised and modernised on several occasions. No trace remains of John Honeyman & Keppie's work. 1: Historic Scotland, listing building report 34021, www.historic-scotland.gov.uk [accessed 30 August 2012]; 'Gourock Reopening of Parish Church', Greenock Telegraph & Clyde Shipping Gazette, 21 April 1900. 2: Roger Billcliffe, Charles Rennie Mackintosh: The Complete Furniture, Furniture Drawings and Interior Designs, Moffat, Dumfriesshire: Cameron & Hollis, 4th edn, 2009, p. 77; The Hunterian, University of Glasgow: GLAHA 52332. 3: 'Gourock Reopening of Parish Church', Greenock Telegraph & Clyde Shipping Gazette, 21 April 1900. 4: A copy of the report (MBS20) is held by the Charles Rennie Mackintosh Society, Mackintosh Queen's Cross, 870 Garscube Road, Glasgow G20 7EL. The Mackintosh Buildings Survey was funded by The Monument Trust.